Does Preoperative Ugi Predict Hiatal Hernia Presence During Laparoscopic Adjustable Band Placement? Hiatal hernia has long been an entity associated with morbid obesity. It has been reported that as many as 50% of upper gastrointestinal (UGI) series done prior to bariatric procedures reveal the presence of a hiatal hernia. Fifteen years ago, hiatal hernia was thought to be a contraindication to placement of a laparoscopic adjustable gastric band (LAGB); this was subsequently refuted and current practice is to perform both procedures concurrently, thus repairing the co-morbid hiatal hernia while placing the gastric band. There is continued controversy over the need for preoperative imaging prior to LAGB placement. It has been suggested that UGI studies should be done to rule out gross pathology while others have shown that this method of pan-fluoroscopy has a poor cost-benefit ratio. We have required routine preoperative UGI studies in our series of laparoscopic band placements; however, we consistently noticed that these radiologic reports were often not congruent with our intraoperative findings specifically in reference to presence of a hiatal hernia. 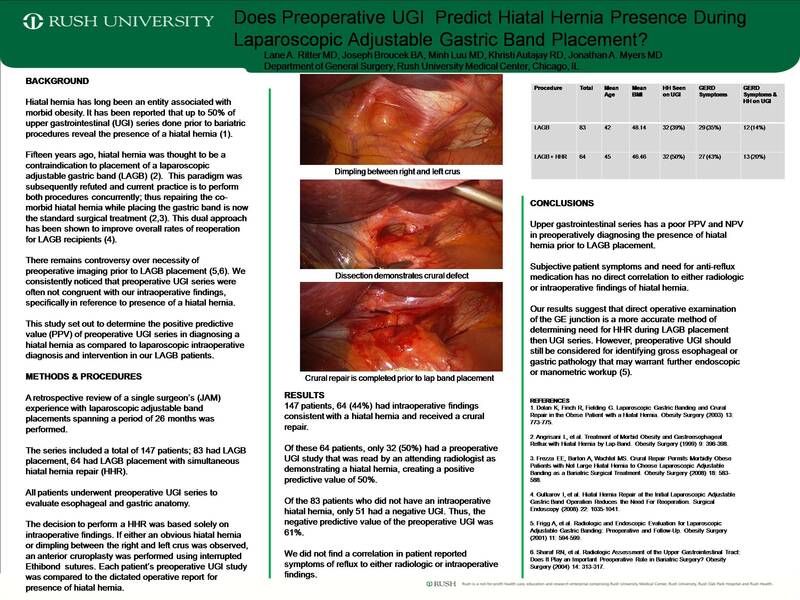 We set out to determine the positive predictive value (PPV) of preoperative UGI series in diagnosing a hiatal hernia as compared to laparoscopic intraoperative diagnosis and intervention in our LAGB patients. We carried out a retrospective review of a single surgeon’s experience with laparoscopic adjustable band placements spanning a period of 26 months. The series included a total of 147 patients; 83 had LAGB placements, 64 had LAGB placement with simultaneous hiatal hernia repair (HHR). All patients received a preoperative UGI series to evaluate for gross pathology. The decision to perform a HHR was based solely on intraoperative findings during pars flaccida dissection. If either an obvious hernia or dimpling between the right and left crus was observed, a crural repair was performed. Each patient’s preoperative UGI study was compared to the dictated operative report for presence of hiatal hernia. We also reviewed the patients’ initial preoperative consultation to determine which patients complained of subjective reflux symptoms or were taking anti-reflux medications. Of 147 patients, 64 (44%) had intraoperative findings consistent with a hiatal hernia and received a crural repair. Of these 64 patients, only 32 (50%) had a preoperative UGI study that was read by an attending radiologist as demonstrating a hiatal hernia, creating a PPV of 50%. In turn, of the 83 patients who did not have an intraoperative hiatal hernia, 51 (61%) had a congruent UGI with no radiographic hiatal hernia, while 32 (39%) had a hiatal hernia according to the radiologic report; making the NPV 61%. We did not find a correlation in patient reported symptoms of reflux to either radiologic or intraoperative findings. Upper gastrointestinal series has a poor PPV and NPV in preoperatively diagnosing the presence of hiatal hernia prior to LAGB placement. Subjective patient symptoms and need for anti-reflux medication had no direct correlation to either radiologic or intraoperative findings of hiatal hernia. Our results suggest that direct operative findings are the most accurate method of determining need for HHR during LAGB placement.